Use in breeding ponds of commercial fish farming operations, including egg and smelt propagation, farming of fish (commercial salmon, trout, tilapia, plus various species for stocking rivers and lakes), mollusks, mussels, clams, shellfish, shrimp, prawns, crustaceans, crabs, crayfish and lobster. Cleaning of water in commercial (public) Aquaria, domestic aquaria, retail aquaria (pet stores and live fish tanks in supermarkets and restaurants), ornamental fish ponds. GO2 is very effective at low concentrations in ponds and fish production basins. Chlorine dioxide is a very selective oxidant and reacts mainly with organic substances, thus maintaining the microbial quality of the water. The major advantage of chlorine dioxide, in comparison with other oxidants (hydrogen peroxide, ozone and chlorine), is its low oxidation power, in combination with a high oxidation capacity. At a concentration in live basins of about 0.04 mg/l (.04 PPM), the bacterial pressure is greatly reduced without having a negative effect on the biology and aquaculture in the water. From a concentration in live basins of 0.1 mg/l (.01 PPM), the ammonia and nitrite levels should be measured regularly. At higher concentrations in basins, from 0.2 mg/l to 0.5 mg/l (0.2-0.5 PPM) GO2 is well capable of significantly reducing and/or solving bacterial problems in fish. The fish will react slightly irritated at higher concentrations. The functioning of the biological filter may also be (significantly) reduced. Clorine dioxide cleans and eliminates all negative water components. These include removes phenols, cyanides, sulfates, iron, manganese and methanogens from water. GO2 also proves effective against ISAV and IPNV. Use in ice on fishing vessels, process factories, trucks, at wholesalers and in retail stores to prolong shelf-life through the progressive release of CLO2 gas to contact surfaces as the ice melts. GO2 can be used with Marine Oil Pollution Solutions, keeping bilge water transparent enough, resulting in Oil Water Separators functioning trouble free and effective bilge pumping. GO2 can be applied to the salt brine solution to freeze fish at low concentration levels (5 PPM) . This results in odor control and extended shelf life of the fish. 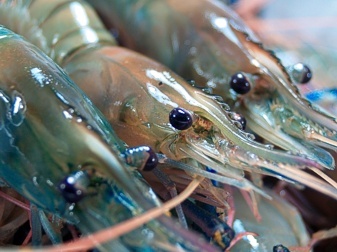 Raw shrimp from farms (natural sea or rivers) are sent to a factory for processing.